Sherr, will be the speaker. Sen Specter will also speak. 12:30 pan. at Satellite 4.
huge committee to help out. the Margate Area UJA is William Katzberg. serves as chairman with David E. Brill, Bernard Cohen. \ of education, Abraham J. Silver. Ruth Simensky, Ethel S.
Honda and the New York Metropolitan area And as always, our services are ref"
plus, Individual 136. Couple $64. UJA campaign will be required. where Krantz serves as president. seen the campaign grow each year. This year. devotion and dedication to all Jewish causes. Lauderdale, will be the guest speaker. You've worked hard, and you want your retirement years lo be happy.
. Scheduled'transportation and private limo service by appointment. Decorjtot modefc open 9-5 every day. bon on adult congregate Name. living at The Honda Club. has a head start at Na'amat-Pioneer Women day cart centers in Israel. between the UIA and the U.S.
distributed in the fall of 1966.
about 90 percent of L.
hKtd me to speak out.. .
was a dramatic change in his life. held prisoner during the war. at the Federation at 748-8400. Israel of Deerfield Beach, 200 S.
See, with its own pool and secluded beach. "jf Laromme hoteLS (intx) Lto. dates to the eighth century. An example of the Stately Architecture that dates to the 12th century. for the handful of Prague's Orthodox Jewish community. ready for the next mission. Waiters who greeted the group at Prague International Airport. who died at the camp. the battle against Nazi Germany. i ran. i < *. i.
eration. 8358 W. Oakland Pk. tion: 8:30 p.m. Billie Falbo. Life Lecture Series: 8 p.m.
Sunrise Jewiah Single*: 2 p.m.
Beach party. Boca Raton Beach. ORT Wynmoor Chapter: 11 a.m.
Meeting and film, "The Mellah." Emanu-El. 3245 W. Oakland Pk. Women's Club of Castle: Noon. 8601 W. McNab Rd.. Tamarac. gion." Donation $3. At Temple. Somerset UJA: 7:30 p m.
stress Lynn Topal will entertain. p.m. Special Gifts. Satellite IV. Guest speaker: Samuel K. Miller. Brunch at home of Ah/era A.
p.m. An Overview of Medicare. Palm Springs III UJA: 10 a.m.
90 IDLES FROM WASHINGTON, D.C.
protecting our residents' feelings of security. such a help, and it's available every day. tor you to tend me your brochure. scheduled the program especially for mothers of preschool children. during a Hanukkah workshop held at the Center in December. performed for a Hanukkah celebmtion December 22nd and 23rd. Publix Bakeries opon at 8:00 AM. ARMDTs director; and Ida SchwiUer, vice president. State of Israel. Instructor: Dr.
charity and the role of women. at 7 p.m. Wednesday Jan. 16.
by SCORE Chapter 17 at 9 a.m.
at 7 p.m. Thursday Jan. 17.
celebrated at the Thursday Jan.
zvah on Thursday morning Jan.
i had-leek ner shel Shabbat. to kindle the lights of Shabbat. Alvin L. Gray, AOF President. Rabbi E meiitua, Dr. Solomon Gald. Cantor Irving Grossman. TEMPLE BETH ISRAEL (742-4040), 7100 W. Oakland Park Bird.! TEMPLE BETH ISRAEL OP OEERPIELD BEACH (4&-MH. lighting time. Rabbi Joseph Lanener, Cantor Shabtal Acktrma*. 33060 Services: Friday 8 p.m. Rabbi Morris A. Skop. Samuel April. Cantor Samuel Reaior. Friday 8 a.m., p.m., Saturday 8:4ft am., ft p.m.
SYNAGOGUE OP INVERRARY CHABAD (T4S-17T7I. 7770 NW I*. services; Women, Tuesday, t p.m. Rabbi Area Liebsrmaa. YOUNO ISRAEL SYNAGOGUE OP HOLLYWOOD-FORT LAUf"? ABUT BNALOM (473-MBM), 11S91 W. Broward Blvd. i V>*eay 8 is ,..; Saturday. 1* am. Peters, Harper & Row. $24.95. Israel in the Mind of America. with the idea of a Jewish state. nounced that Cypress Chase "C"
tion Hall Thursday evening. Jan.
surgery without discomfort, without bsndsges. Call for more information and a no-cost consultation. 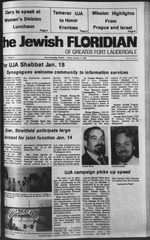 Page 12 The Jewiah Floridkn of Greater Fort Uuderdale/ Friday, January 11,1986. 30100 S federal Hwy 247 162?